Originally, the seep of the Hot Spring was covered by light structures and pavilions that could be easily replaced after repeated bursts and unexpected therm irruptions. The spacious Baroque Vřídelní sál (Hot Spring Hall) built in its vicinity in 1774 reflected the application of the curative methods of Dr. David Becher who laid great emphasis on drinking the healing waters directly at the source. The very first uniform architectonic concept of the area surrounding the Hot Spring was embodied by the Empire Hot Spring Colonnade built according to the design of Josef Esch in 1826. It was replaced by the new cast-iron Hot Spring Colonnade constructed in Pseudo-Renaissance style according to the design of Viennese architects Ferdinand Fellner and Hermann Helmer between the years 1878 and 1879. Unfortunately, the corroded colonnade had to be disassembled in 1939 and replaced by a temporary wooden structure for the next 27 years. In 1975, the new modern glass and reinforced concrete colonnade was built in Functionalistic style according to the design of architect Jaroslav Otruba. The geyser of the Hot Spring is in a separate pavilion and it gushes to a height of almost 12 metres. 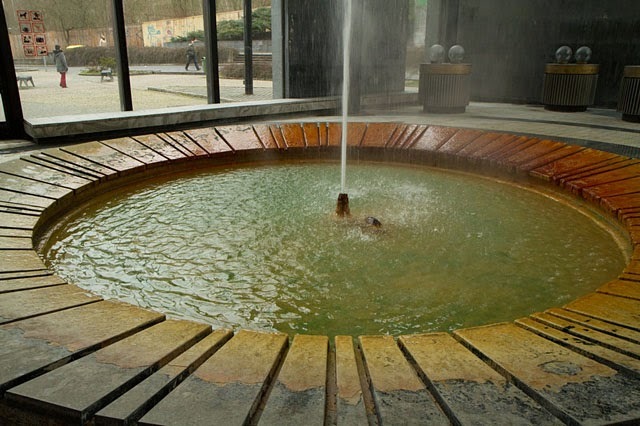 The glass-prism dome arching over the seep of the Hot Spring is the work of sculptor Jan Fišer and symbolises the beating heart of the spa town. The spacious promenade hall houses five additional spring bowls, marked A, B, and C, in which thermal water is cooled to a temperature of 50 and 30°C in order to be suitable for the drinking cure. You may also find souvenir stands and an exhibition area at the gallery of the promenade hall.